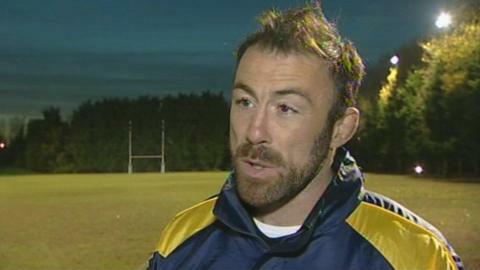 Worthing Raiders head coach Kieron Dawson says the club are considering plans to move to a new ground. The National League Two South club have been based at Roundstone Lane in Angmering since 1977. He told BBC Sussex: "It is a very ambitious club and there is talk of maybe moving grounds and building a little stadium. "I don't think I can say too much but it is in the public domain that the ground is for sale." The former Ireland international added: "One of the caveats of that is that whoever buys the ground provides sporting grounds for us. "The board is very ambitious and the club is well equipped. It would take the club to a whole new level. "With a purpose-built stadium and grounds you can generate other income." Worthing may need improved facilities in the future as the first XV are challenging for promotion this season. The West Sussex club currently sit top of the National League Two South table, in what is their fourth campaign in English rugby's fourth tier. "The players told us [at the start of the season] they'd like to finish higher than we did last year, which was seventh," Dawson said. "We [the coaching staff] were a bit disappointed by that as realistically our team should be thinking about winning this league. "The players genuinely believed we could go out and win it last year but ultimately we didn't have a deep enough squad. "We had a few injuries and just couldn't compete with the top sides in the run-in. "This season we have strengthened the squad. In some respects we were playing better last year but there is that inner belief that we are capable of going out and winning the big games. "That is a mentality that may have swung from last year."